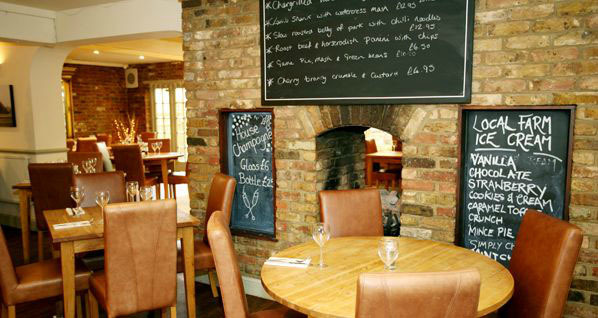 The Palmer Arms, Dorney, Berkshire, UK. 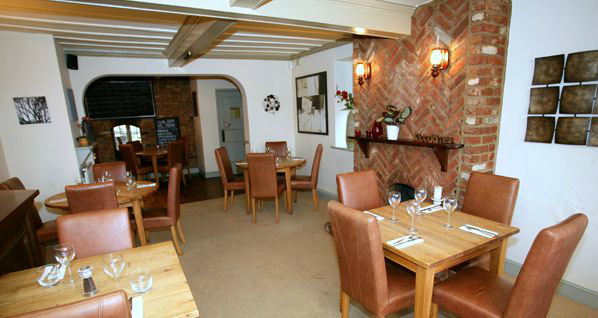 The Palmer Arms is a place I would consider a “Gastro Pub”. What I mean by this term is that they serve traditional pub food with a gourmet twist. You won’t find soggy peas or uninteresting food in these establishments. Instead, they attract their visitors with well prepared food, hearty portions, and a more relaxed atmosphere than a restaurant. It was a bit funny explaining to these very British friends about our blog and seeing their faces when I whipped out my huge camera to not only photograph my food, but theirs too. It really isn’t British to talk about food, or to impinge on another person’s personal space (namely their food in this case). However, they were very good sports about it, and we all ended up having a good laugh. 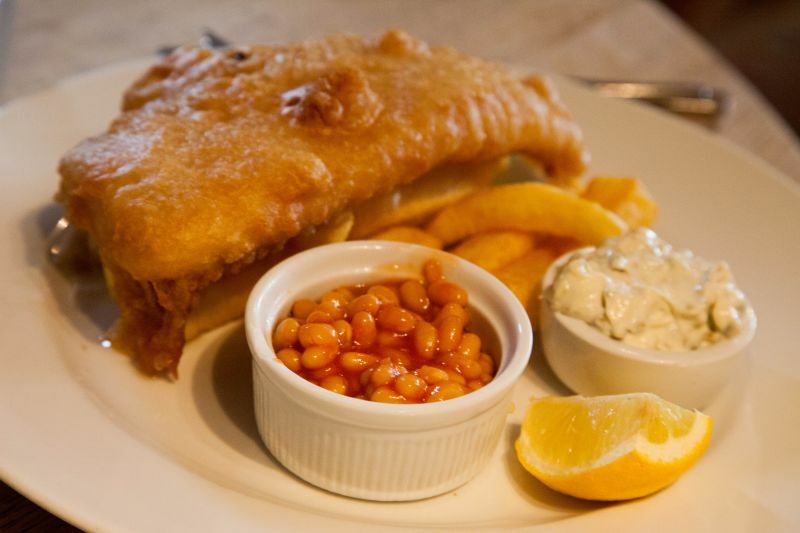 The Brit and I were craving some of our favorite British dishes. Poor Brit, he seems cursed to not find a dish of Fish and Chips in Napa that is up to his standard. I ordered the pan fried Sea Bass, our friends ordered Shepherds Pie (ground lamb in a brown gravy with onions with mashed potato on top and then grilled until the top gets crispy) and the other one ordered a traditional lamb shank on a mashed potato pillow. All of these four dishes were traditional British fare and we were in a nice place to eat it. The Brit comments: Note that the Shepherds’ Pie was made with lamb. Back here in the US restaurants serve a dish to which they apply the name “Shepherds’ Pie”, but made with beef. 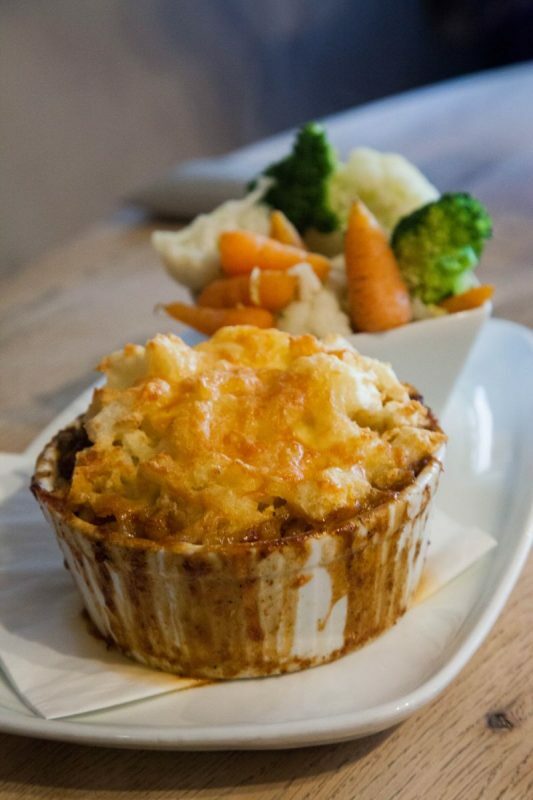 You cannot make Shepherds’ Pie with beef, as the name for a pie made with ground beef is Cottage Pie. I feel almost as strongly about this abuse of the language as I do when people slap the name Martini on a cocktail that is not made with gin and vermouth. We didn’t order any wine on this occasion as we were all driving some distance and instead chose to drink water. The Brit had a pint Greene King beer with his food. 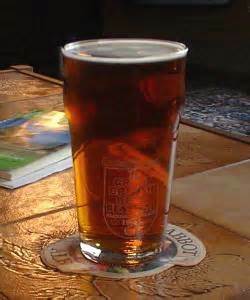 The Brit comments: They should also offer Real Ale; a uniquely British version of beer. Unfortunately, the beer at the Palmers Arms was somewhat insipid; drinkable, but not memorable. All of the dishes arrived and they looked appetizing. 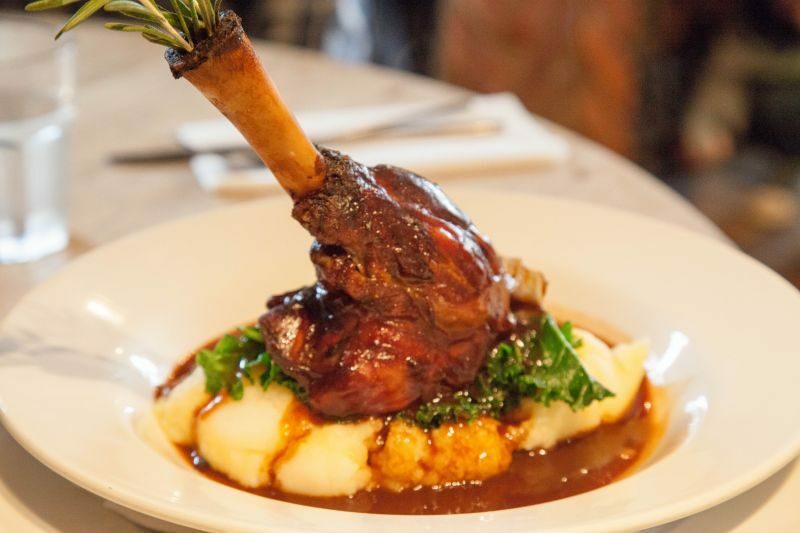 I think the star of the show, though, was the lamb shank with rosemary stuck out from the bone. I was really salivating as I saw it arrive and could smell its meaty goodness all the way from the other side of the table. 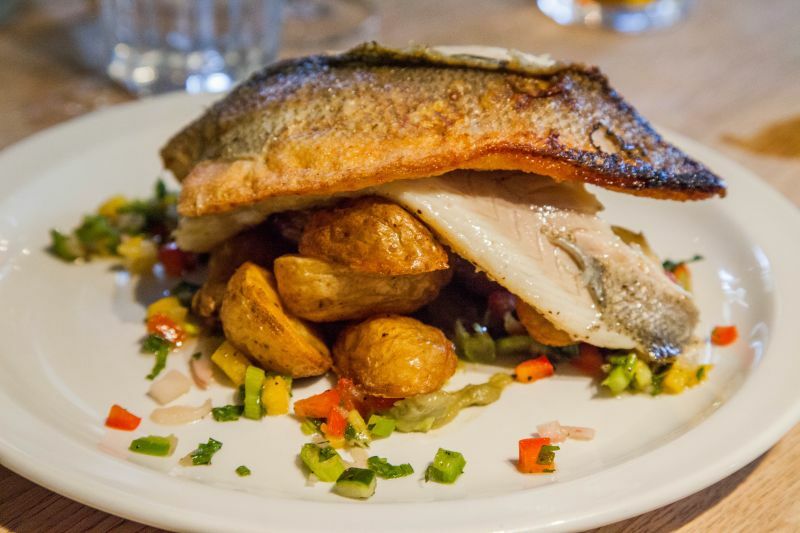 My Sea Bass dish was lovely. Pan fried until crispy and served on top of roasted veggies and potatoes, it was a feast for the eyes. It was light, tender, juicy, and crispy all at the same time. The roasted potatoes and sautéed veggies were amazing with it. It was a lovely dish that I would be happy to eat again. Our other dining companion tucked into her Shepherds pie with enthusiasm. I could hear appreciative noises from her as she ate. I really liked that they put the peas and carrots on the side of her dish rather than in the Shepherds Pie. Poor Brit was a bit disappointed in his Fish and Chips. Whilst they were cooked fine, and the batter was light, there was something missing there that just didn’t do it for him. His meal was a little bland. He had a very sad face. After such a heavy meal at lunch time, we were all too stuffed to try any of the long lists of desserts on offer. 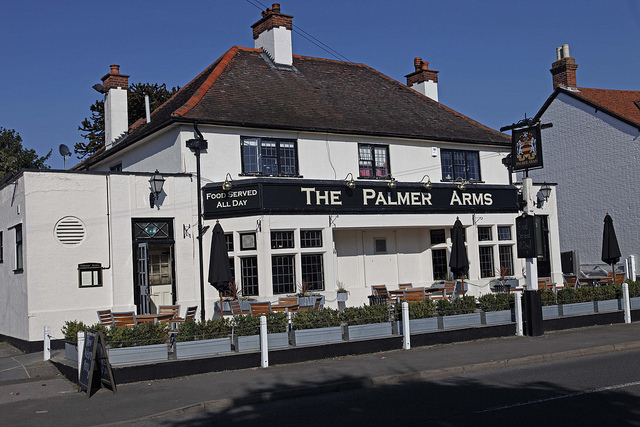 It was a nice meal with fun friends and we wouldn’t hesitate to visit The Palmer Arms again on our next trip to England. The Brit comments: The name Palmer refers to someone who had been on a pilgrimage to the Holy Lands, as they would usually return with a palm frond as a symbol of their journey. It’s National Zinfandel Day! Here are a couple of our picks!